The Royal Victoria Coffee Hall is now the popular London theatre, The Old Vic. 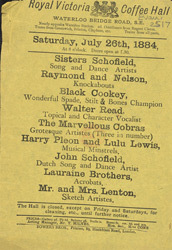 In 1880, the management of the venue passed to Emma Cons, a committed social reformer. She renovated it at a cost of over £3,000, a huge amount at that time. Prior to Cons' involvement with the Vic, the venue had quite a lurid reputation, but she steered it towards propriety, remarketing it a Temperance Hall where no alcohol was sold . Cons bought the title deeds to the hall in 1888, and on her death in 1912 passed them to her niece Lilian Baylis. Under Baylis, the Vic expanded its traditional repertoire to include opera, performances of Shakespeare plays, and even early motion pictures. Baylis went on to found the Sadlers Wells Theatre in 1925.